What is Holistic / Integrative Medicine? Simply stated, Holistic Medicine focuses on the whole patient–mind, body, spirit, and environment–to diagnose and treat medical imbalances. Because the body’s endocrine (glandular) system is controlled by the autonomic nervous system (see Acupuncture-How Does It work Really? ) emotional and environmental factors can be crucial in the successful healing outcome. Diagnosis is based on actual physical parameters (Tongue, pulse, and acupoint analysis) which gives an accurate assessment of that individual patient’s body’s functioning at that very moment, and can be easily reassessed at each subsequent acupuncture session. We will know immediately if the patient is responding well to treatment and protocol can be adjusted as needed. Conventional Medicine is based on a different paradigm which involves diagnosis and treatment based on a set standards for the disease or syndrome, not the individual patient. The treatment is the same for all patients no matter what their physical and emotional circumstances may be. The diagnosis is usually based on the results of diagnostic tests ( blood chemistry, x-ray, MRI, etc.) with relatively little interaction between doctor and patient. Integrative Medicine combines the best of both natural (holistic) healing (my specialty) and the advanced conventional medical technology available via conventional medicine to diagnose and treat the patient’s condition. While I prefer natural treatments because of the specificity of diagnosis and treatment, we will avail ourselves of conventional medicine when appropriate. 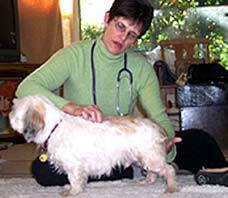 I will work in tandem with your regular veterinarian or can recommend a conventional vet in your area.